Entrance by a beautiful and nice garden which enjoys the morning sun. This house is on a very pleasant location because it is near the center of Port Grimaud 1 in a quiet neighborhood with the charm of villages of Provence. 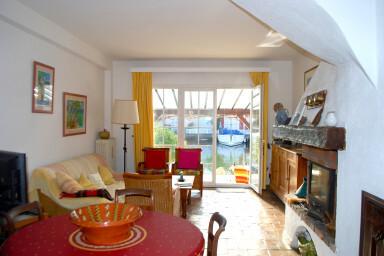 On the ground floor, a living room open to kitchen and on a nice terrace partly covered on the canal side. This West oriented terrace has a pleasant lighting at night. Additional toilets. On the first floor, 2 bedrooms, bathroom and toilet. On the second floor, 2 bedrooms, one with balcony and a beautiful view of the canals. A bathroom and toilet. House well maintened and warm. Mooring with pontoon 12 x 4,20 m.
RARE ! House sold with a garage.